Bramblewood Fashion | Modest Fashion & Beauty Blog: What I Wore | "If you just wanna take me home..."
Anyhow, about my outfit. I wanted to wear something that is comfy, stylish, and looks good on camera. 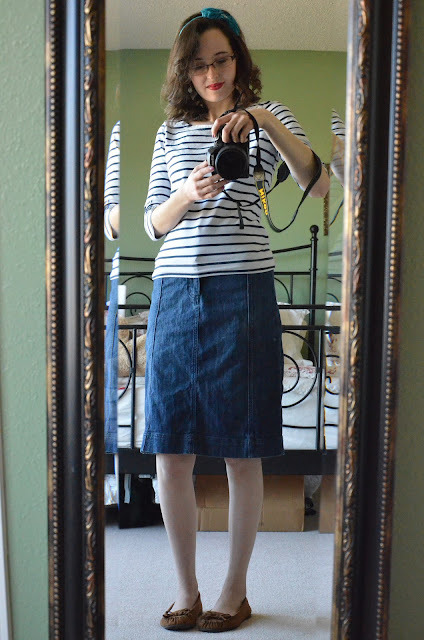 I decided to go with my favorite stripe tee from Forever 21 (I'm always wearing this when I film), a jean pencil skirt that I haven't worn in awhile, and some moccasin's for a comfy/stylish option that feels like slippers. For accessories I kept it simple, just some bubble earrings and a fun headband. Btw, how do y'all like the new blog header? Keep it, or change it? I really want a jean pencil skirt, like that... only minus the zipper.... I don't like zippers much. And I just can't find one!! I like the new header too! It's always fun when bloggers change up their design just a little. Adorable, Ashley! I love casual, simple outfits like that. Can' wait for the videos!!! :D I love watching the videos that you put up on YouTube! I love the way you wore your striped shirt. I recently bought a striped shirt from Forever 21 and then paired it with a floral skirt. I really love the way you did your header as well. Very lovely and feminine. I'm loving the red lips! You rock them! As to the header, I like it! But of course, you need to like it more than anything else! I like your new header. And the background is lovely! I like your nail colour and your stripe blouse. They look great on you. Your messy hair highlights your beauty more.